Achillea millefolium is an aromatic perennial herb, 20-100 cm tall, stem sparsely or not branched, sprouting from deep, extensive rhizomes, sparsely colonial; stems finely hairy to wooly, gray-green. Leaves alternate, blade 3-15 cm long, to 2.5 cm wide, gray-green, lance-shaped, 2-4 times finely dissected, feathery, stem leaves sessile, over-wintering basal rosette larger, stalked. Leaves eaten by rabbits, mice, deer (Martin et al. 1951). Flowers dull white, minute, of two types, in small heads subtended by small bracts, ray flowers about 5, 0.2-0.3 cm long, disk flowers 10-30, tubular, densely crowded in heads, 0.2-0.4 cm wide, 0.4-0.5 cm high, basal bracts overlapping in several series; inflorescence of numerous heads in broad, flat-topped clusters; an obligate outcrosser, pollinated by insects, visitors mostly flies and some bees (Mulligan and Kevan 1973); blooming and fruiting June-Sept.
Fruit dry, 1-seeded. Seeds about 0.2 cm, winged, wind dispersed. Persistent in soil. Winter stems with brown flat-topped inflorescence remnant (Levine 1995). Origin: Both native and introduced from Eurasia; native variations generally have smaller inflorescences (2-10 cm wide), compared to the introduced variety (6-30 cm wide) (Warwick and Black 1982). According to Gleason and Cronquist (1991), the European type has relatively flat leaves with rather broad ultimate segments and is rarely found in the northeast, whereas the native variety has narrower leaf segments in various planes, appearing more 3 dimensional. Habitat: Open areas, roadsides, meadows, soil pH 6-8 (CABI 2015), but may require disturbed soil to germinate and become established (Goldberg, 1987). Notes: Tolerant of drought. Somewhat shade tolerant. Contains insecticidal amides and has been used as a medicinal. Contains the essential oil “oleum millefolii” and the alkaloid achilleine (Warwick and Black 1982). Nectar used by a number of mosquito species: Aedes spp., Anopheles spp., Culex spp., (Diptera). Fed upon by numerous Lepidopterans including: flower-feeding moths, Chlorochlamys chloroleucaria (blackberry looper moth) and Eupithecia nimbicolor; stem boring moths; Papaipema nebris (stalk boring moth) and Platyptilia pallidactyla. Yarrow is also host to a number of aphids. 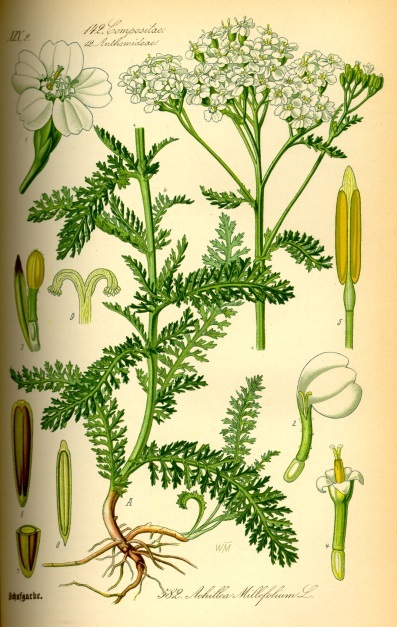 Fungi that have been found on yarrow include Ceratobasidium anceps, Entyloma compositorum, and Leptosphaeria millefolii (Warwick and Black 1982).